Here's a step by step on how to deploy a Hyper-V Cluster on Windows Server 2016. Before you start make sure you have already installed all the required features/roles and configurations on the Hyper-V nodes. Two Virtualization Hosts same CPU and RAM is recommended and Windows Server 2016 Installed. At minimum 2 NICs per host (One for CSV/Heartbeat and Management/Guest VM's, make sure servers can communicate to each other). On the BYB page, Next. On the Select Servers page, enter servers you will like to add to your cluster and then Next. On the Validation Warning page, Yes to run configuration validation tests then continue on the validation wizard. On the Testing Options page, Run All tests (recommended) and then review the results. If you have any warning or critical issues please make sure you correct them before you proceed with the cluster creation. On the Validation Summary page, view report if necessary and then Finish. On the Access Point for Administering the Cluster page, enter Cluster name and IP then Next. On the Confirmation page, review then Next. On the Summary page, review cluster creation results then close and Open the Failover Cluster Management Console. Make sure the disks are online and initialized. On the Quorum Configuration Select the quorum witness then Next. 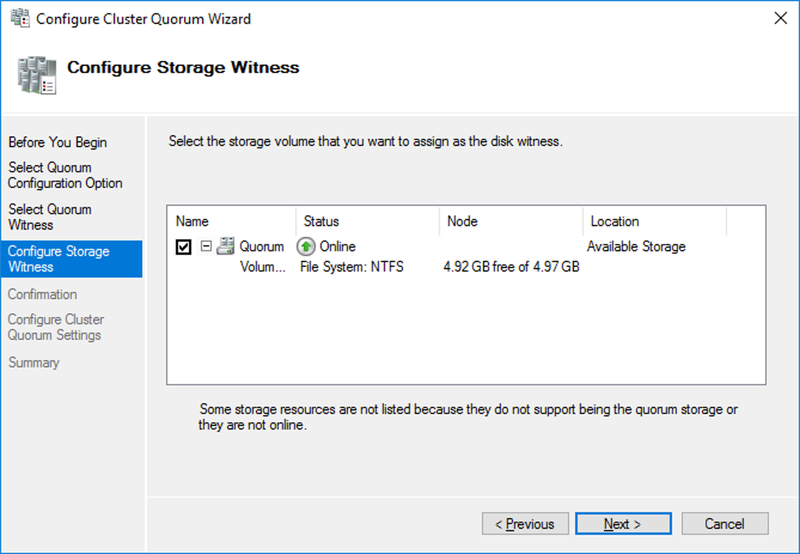 Select the volume you want to assign as the witness, Confirm then Next to complete the Quorum configuration. Confirm the cluster Quorum disk it's available. Add or create a VM/Role. Perform a Live Migration to test HA. Add more storage volumes if necessary. Remove and Add VM's to the cluster to test functionality. That's it you have now created a Hyper-V 2016 Cluster.